Heirloom varieties are cultivated and nurtured over generations to yield the most crisp and delicious versions. Resown from previous generations, heirloom produce outshines almost any other seed. 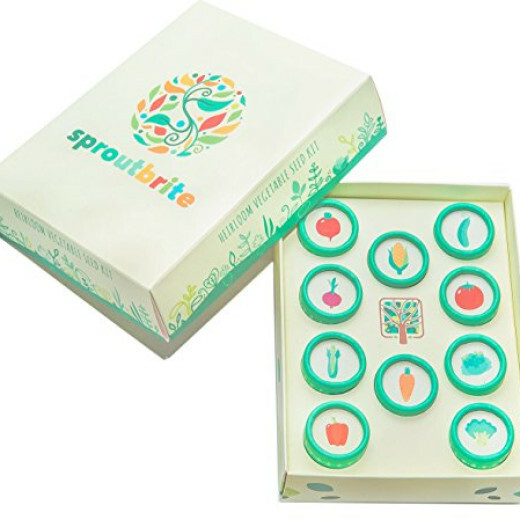 The Sproutbrite Vegetable Kit includes 10 well loved varieties by our small team in Westchester, NY. Responsibly sourced, uniquely presented, and carefully assembled - this kit is will bring a smile to the recipients face. Adults and children alike will be excited to experience their first vegetable harvest with this kit. Includes: Brandywine Tomato, Cherry Belle Radish, Tendersweet Carrot, Golden Beauty Corn, Great Lakes Lettuce, Red Burgundy Onion, Delikatesse Cucumber, Utah Celery, California Wonder Pepper, Calabrese Broccoli It's a perfect gift for mom, sister, co-worker or friend. Just about anyone who enjoys gardening will appreciate our kit. Our seeds are saved direct from the crops and delivered to us in small quantities to ensure maximum germination.